I’m also celebrating the end of March Madness Poetry! It’s too late to vote in the final match, but you can read my gargoyle poem here if you’d like. I had a lot of fun writing six(!!) March Madness poems–but I am also happy for that challenge to be over. Thank you to everyone who read and voted for the March Madness poems and who shared links and spread the word about the competition. Your kind words, support, and enthusiasm meant so much to me! One more reason for me to celebrate is that tonight is the first night of Passover. I was delighted that Sylvia Vardell and Janet Wong included my Passover poem in The Poetry Friday Anthology for Celebrations. The seders of my childhood were led by my father, who did not believe in leaving anything out. He and his sisters would race along in Hebrew, while we kids would participate or not–there was always plenty of squirming. I tried to capture the mood of those seders in my poem, especially the pride I felt when I recited the four questions. the table is gleaming and bright. a story for Passover night. he’s lurking beneath Grandpa’s chair. while Grandpa is leading a prayer. Why are there matzos, salt water, and herbs? Why must we lean to one side? each year we recite it anew. we’re thankful that season is through. The afikomen* is a piece of matzo that’s broken during the Seder and eaten at the end of the meal. In some families children steal the afikomen and ask for a reward for its return. In other families an adult hides the afikomen and the child who finds it receives a prize. Neither of those options happened in my family–my dad was an oral surgeon and everyone got toothbrushes when someone found the afikomen! I recently learned from a cousin that toothbrushes are still featured in her family’s seder. My kids made out much better when they were young. Happy National Poetry Month and Poetry Friday! Be sure to visit Amy at The Poem Farm for the complete roundup of today’s Poetry Friday posts. This entry was posted in Uncategorized on April 3, 2015 by Buffy Silverman. I can’t believe that I’m just getting around to congratulating you on winning the MMPT by writing Poetry with a capital P! It was a good matchup, actually, but you deserved to win and you did. And you’re right–there’s so much to celebrate right now, not only victories but traditions and –toothbrushes! Thank you, Heidi–I’m not sure all of them qualify for the capital P (but maybe with revision they can earn the title.) Glad you enjoyed them. Thanks, Michelle–glad you like the poem. 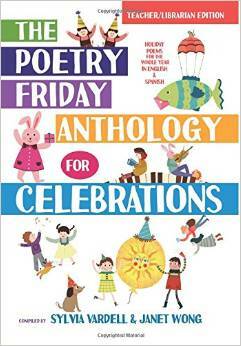 I am not sure whether we have the Poetry Friday anthologies here in Singapore but would definitely recommend to our librarian. Thanks for sharing this! Love this, Buffy! Again, congrats on your big win! Have a great holiday. And a happy Passover to you, Ellen! Another CONGRATULATIONS on being the Top Poet this year, and a SHALOM for Passover! What a fine seder poem. Love learning more about your family traditions and smiled about the toothbrushes. Happy Passover and Congrats again on winning March Madness! Everyone remembered my dad for the toothbrushes–an interesting legacy! Hi Buffy, I too am celebrating our partnership! What a lovely passover poem. Yes, I think you captured the ritual–from the pride of asking the four questions to the squirming under the table. And congratulations on your March Madness victory! You wrote great poetry, under time pressure, for weeks! Time to get to my daily poem. Thanks, Liz. I’m so glad we’re doing the exchange! I love the poem and the toothbrush story. – her reminder that there is so much any of us can do. Congratulations, Buffy! What fun you and Liz will have being poetry pen pals this month. Thank you for this seder gift today. I am taken back to my childhood in which my mom taught at Hillel Academy, and we were invited to many such a family meal. Wonderful days. Thank you, Amy, and thanks for hosting this week! Thank you, Donna–I enjoyed your March Madness poems, too!